We went for a walk to the (chilly) beach yesterday with friends visiting from California and happened upon a family setting up their Christmas photo. I was fair to bursting with curiosity to see what they were up to when they piled out of their car & the mom was carrying what looked like a ball, but oh-so-carefully that it had to be something quite wonderful. And it was wonderful! She had sprayed adhesive on a soccer ball & attached raisins, some dried plums, and a carrot to make a cheery face. 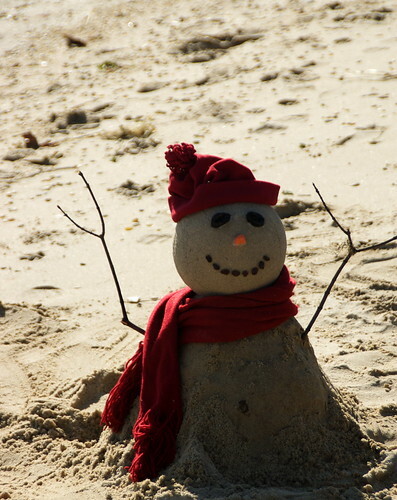 Once at the beach she sprinkled on a layer of sand for the perfect effect, and added the requisite happy hat and scarf. Isn't this great? I wish I'd thought of it myself! How fantastic is that! Love it.